From this search, you can quickly get to anything and everything on your computer. Keep this in mind from now on, because it’s going to change how you name your files. Each file should have a unique, obvious and easy-to-remember name so that searching for it is intuitive. If you just transcribed an interview with a source, don’t name the file “interviewnotes.doc.” How will you find that file among all the other interview notes you’ve saved? Instead, name it “nameofsource-interview.doc.” When you need it, press Command + Spacebar, start typing in the interviewee’s name, and there you go. Think of it as turning your computer into a mini search engine. You know how easy it is to use Google: That’s because it’s easy to search. Make using your computer just as easy. Start using Command + Spacebar, and start getting rid of that pile of crap on your desktop. Do you use Spaces? If you’re working on an iMac, or you have your MacBook or MacBook Pro connected to a large monitor, you may not need this solution. If you’re working on a laptop, then Spaces can be your best friend. 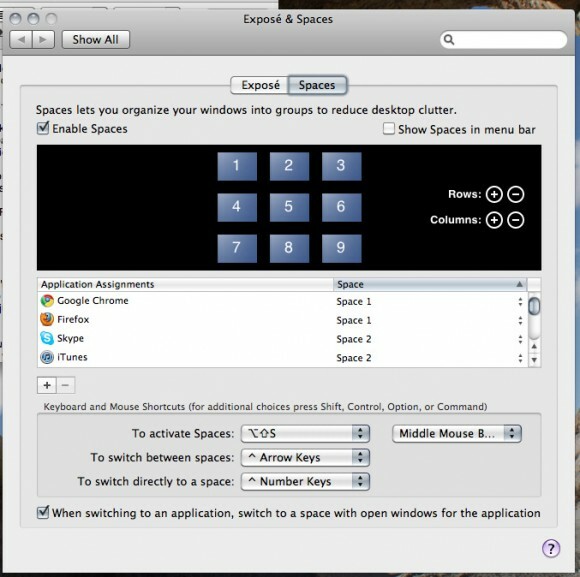 Spaces is a Mac feature that provides multiple desktops. Based on your preferences, you can have practically any number of workspaces. I use 9. (Yes, I know that’s kind of ridiculous.) But you can get a lot out of using just 4. One of your F keys will take you to spaces, but since that can differ based on settings, we’ll get there by typing Command + Spacebar, and then typing “Spaces” and hitting Enter. 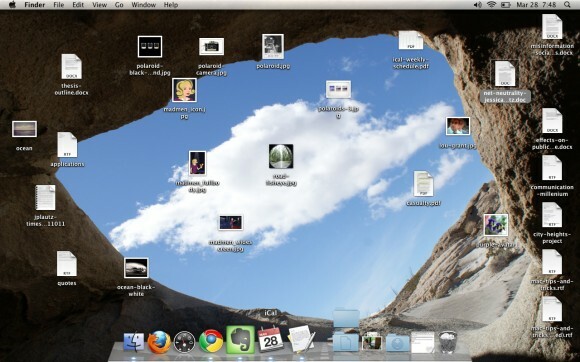 Each of the rectangles is a separate desktop. Click on one of them and you’ll go straight to it. To go to different spaces without seeing all of them, hold down Control and use the arrow keys. Imagine you’re researching U.S. Census data: You’ve opened a web browser, an Excel spreadsheet, and maybe even several PDFs all at the same time. Now you’re juggling windows, minimizing, maximizing and otherwise wasting time just getting from one program to the next. 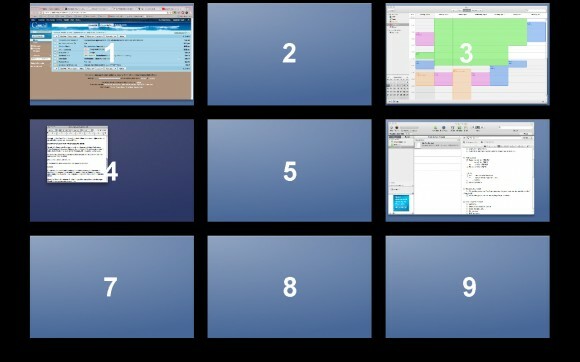 Instead of fitting all those windows on one screen, you can organize them with Spaces: Open your browser in Space 1. Open Excel in Space 4. Open PDFs in Space 4, or Space 2, or wherever makes the most sense to you. You’ll be able to move quickly to each Space using Control + arrow keys, and once you’ve got the window positions in your head (give it an hour) you’ll waste no time trying to find a window that’s hidden behind three other windows. Time saving. Space saving. Spaces! Add or delete rows and columns based on how many spaces you’ll use. Decide which programs should open in which spaces. In the above panel, you can make sure that the browser always opens in Space 1, that Word always opens in the Space 2, etc. And a final note on Spaces: They’re excellent for hiding what you’re actually doing when you should be working. I’m not suggesting you don’t work, I’m just recognizing that everyone needs a break once and a while. Hit Control + arrow key and that game of Sudoku is gone! And you’re back to your Excel spreadsheet, just like a good little reporter. Mac trackpads have some significant benefits over PC trackpads. Soon, hopefully, PCs will catch up. In the meantime, take advantage of these. This one’s easy: Use two fingers on the trackpad on any window that’s larger than the screen, and move up or down to scroll. Yes, yes, I know, you already know that. You know it works sideways, too, right? Again, with two fingers, move your fingers either closer together or farther apart. This takes a little getting used to before you aren’t jumping in and out of the screen. Once you’re used to it, you’ll be able to zoom in to see small text or zoom out to see an image with just a swift movement. Using three fingers, swipe to the left or right in a browser window (Firefox, Chrome…if you’re using Safari just stop it. Now.). Assuming you’re not on the first page you opened the browser in, you’ll go to the last page you were on, or back to a page you had clicked on. And you thought you had to go all the way up that little arrow and click to go back to the last page, didn’t you? Got Mac tips of your own? There are plenty I’ve left out, so please share them in the comments. And stay tuned for my next tips: Getting organized with Google Reader, Instapaper and Evernote. I totally agree with good file-naming practices — and if you’ve ever been in a position to write a file-naming convention policy document for a whole organization, well, then you know the true meaning of power. But what does a clean desktop have to do with using Spotlight? If you rely solely on Spotlight, then a clean desktop doesn’t matter. Also, relying solely or mainly on search removes another bit of mental metadata — place — when it comes to storing and retrieving important facts about what we’re doing, what program we used to do it, and where we put the files. Not having a sense of “place” about documents is like taking away one of your five senses. 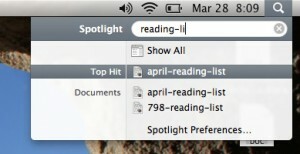 Besides all the other things about Spotlight that annoy, such as that it doesn’t display file paths, it doesn’t display full file names, and it’s slow on computers (I hate the search-as-you-type) that have lots of files (such as having more than 160,000 pieces of mail alone). PS: On edit: I realize you can do the mouseover of spotlight results to see file paths — but you have to do it for every single result! My suggestion for using Spotlight to help with a cluttered desktop is based on something I know a lot of people do: keep stuff on the desktop so it’s quick to get to it. 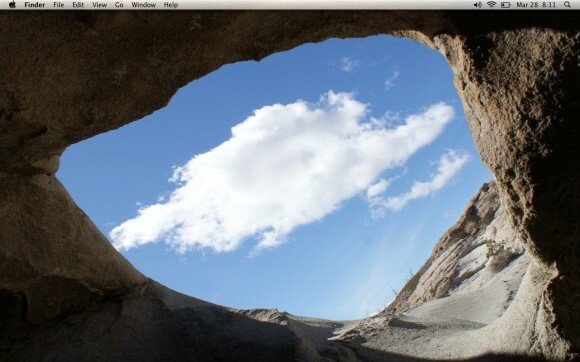 Spotlight offers an alternative, and the clean desktop offers other benefits. I agree on knowing where things are and having a sense of “place.” In case the post doesn’t make it obvious, I’m a bit obsessed with organization, and having a good filing system is important, maybe even vital. I could write a whole post on mine, but I might be the only one who finds it interesting. But if someone’s looking through the stuff on their desktop trying to find a file, learning to search is a good way to get started. As a side note, not having prominent file paths was something that bothered me when I originally went from PC to Mac. PCs are so hierarchical they can make Macs look like…not sure what simile I’m looking for here. Once I figure it out I’ll post it. Oh, yes, it’s clear you’re obsessed with organization! It’s a good thing. Chaos must be restrained. Lead the way! Regarding file paths: I’ve mainly been a Mac-head for 20-plus years, but when OS X came out ten years ago, I really started to appreciate directories, especially immovable ones, a lot more, because it’s so much more important to some of the open source tools that have become a key part of getting work done. I like Alfred as an alternative to Spotlight. It gives you the option to search Google, Wikipedia and Amazon in addition to your own computer.